(first posted 10/11/2013) Recently, I’ve been getting into the habit of visiting commuter rail parking lots in search of Curbside Classics. They’re a great place to take lots of pictures without being bothered by the long stares and questions I often get from others when I’m photographing a car. This is the very station where I catch the train into Boston, so I’m quite familiar with the car clientele there. I’d swung in intending to photograph another CC when I spotted this Buick Electra, one I’d never seen previously. The final-generation Electra has already been extensively covered here. Found by Tom Klockau, that one was a first-model-year 1985. The one you see here is a 1989 model, as verified by the 10th digit (K) of its VIN number. 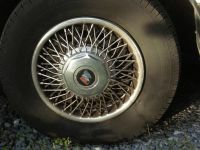 Its weathered condition is totally understandable for a 24-year old car–even one whose odometer, surprisingly, showed only 33,584 miles. Although no drastic changes occurred over the four years separating the two Electras, I still find it interesting to compare the minor visual differences between them. Of course, I should also note that the ’85 is a top-of-the-line Electra Park Avenue, while this ’89 is the slightly less plush Electra Limited. Contrary to normal assumptions, the Limited was actually the least expensive 1989 Electra one could purchase, and the original buyer of this one was one of only 5,814 people who opted for the cheapest Electra model. Externally, Park Avenues were differentiated from regular Electras by their wide chrome lower-body moldings and electroluminescent opera lights. The 1989-1990 Park Avenue Ultra was made even more exclusive with two-tone paint schemes and aluminum wheels. Base Electra Limiteds still came with plenty of exterior chrome, wire wheels and a stand-up hood ornament, all designed to appeal to the hearts of even the truest of Broughamantics. 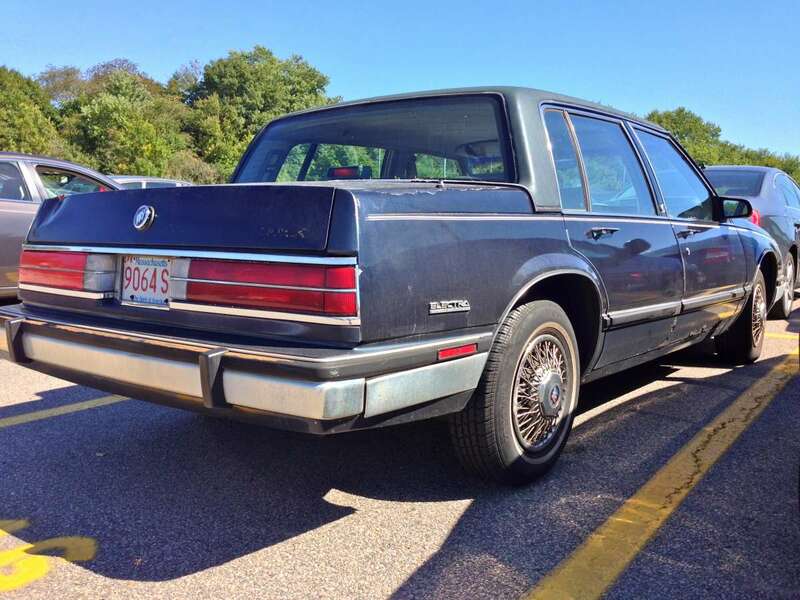 This one even has the available padded vinyl roof, making it a true Brougham. As noted, in 1987, Electras received composite headlights in place of the outdated quad sealed-beam units. I’ve always liked the clear-lensed turn signals, which bring a little Euro to the “Great American Road”. On the inside, Electras pampered their six occupants with soft, pillowy velour seats, just as one would expect. Park Avenues offered a fancier seat design, as well as available leather. 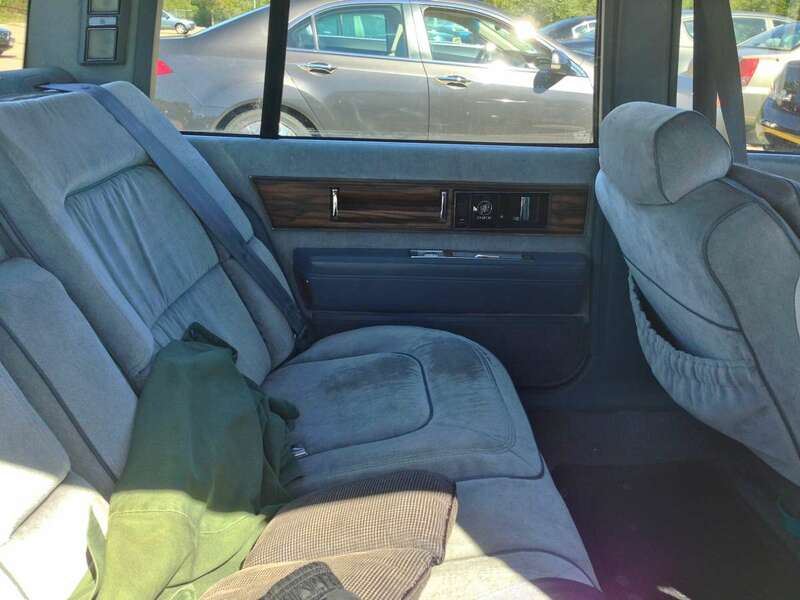 Probably the biggest visual difference between the ’85 and ’89 involves the simulated wood trim used throughout the cabin. The 1985-86 Electras used a lighter, poplar-looking plasti-wood, while later models used the darker–and frankly, more Chevy-looking–wood trim seen here. In 1989, the front seat belt mounts were moved to the doors and rear outboard shoulder belts were added. Possessing the right formula, these Electras sold quite well. Although sales of over 140,000 first-year units naturally gave way to smaller numbers year after year, the Electra still managed to sell over 80,000 units annually until the final 1990 model year, when less than 50,000 found homes. Sales performance was on par with its largely identical platform mate, the Olds Ninety-Eight, as well as a completely unrelated C-body, the Chrysler New Yorker. While the Cadillac DeVille historically sold in high numbers, I was rather surprised to learn that even the much maligned ’85-’88 FWD DeVilles sold in much higher numbers than the cheaper Electra. While still classically attractive, the Electra was looking tired by 1990. Aero was in and boxy was out. Buick’s replacement for it would borrow much of its design from the stunning 1989 Essence concept car, and its second- biggest change would be a different name. 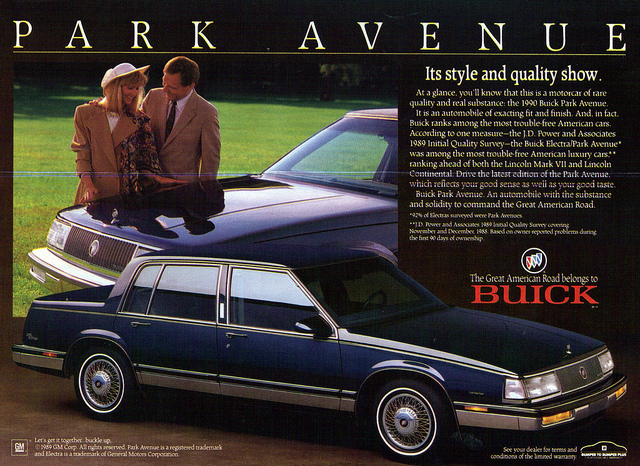 After 31 years, Buick decided to ditch the Electra nameplate in favor of “Park Avenue”. As already evidenced, Park Avenue wasn’t a totally new name to Buick, having been around as an Electra trim package, and later a trim level, since as far back as 1975. And, to be fair, by 1987 nearly all Electras sold were Park Avenues. 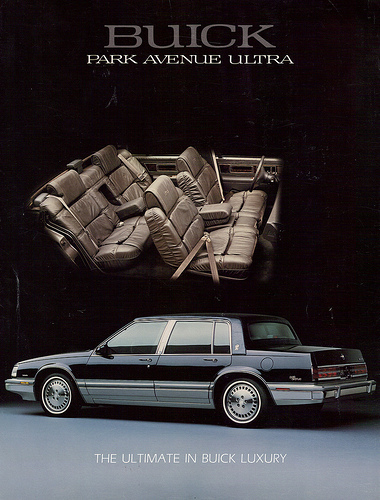 In contrast to sales of 5,814 Electra Limiteds in 1989, there were 71,786 sales of Park Avenues and 4,815 T-Types. In any case, I personally prefer the Electra name, and I think it would have suited the more electrifying 1991 Park Avenue just fine. I also think it would make a better Buick flagship name today. I know Buick is trying to draw younger buyers, but “Lacrosse”? Really? Unless the majority of Buick buyers these days are Lax Bros and I’m unaware of it. But I digress. Apparently Buick buyers didn’t mind the name change, as sales of the 1991 Park Avenue shot up a full 220% over the 1990 Electra. It truly was an example of how important styling is when it comes to a car’s success. Sales of the closely related (yet far less tasteful) ‘91 Ninety-Eight actually declined versus the six-years-old design 1990 model. 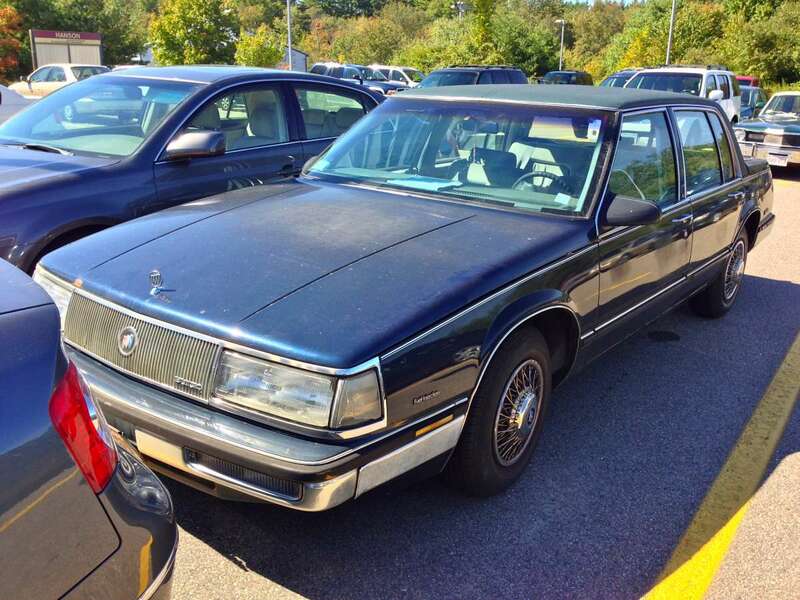 It’s also no secret that by the late eighties, Buick had become the retirees’ special. Unlike Oldsmobile, Buick played up to this fact in its advertising and with products increasingly aimed at that consumer group. Nothing about sportiness, speed or being fun-to-drive… no, no, no, Comfort, quality, and value were the buzzwords that drew in the buyers. While Buick might be kicking itself for cars like the Electra today, they were the kind of cars that kept cash rolling in, probably saving Buick from the fate that befell Oldsmobile. Give the people what they want, and they will come. Well, I guess it’s a nice-enough car, just nothing exciting in any way. I understand the buying public’s reaction when the successor Park Avenues came out; even as a thirteen-year-old kid from Europe, I though those were really stylish, exciting even. I just saw a green Park Avenue a few weeks ago on my way home. Even though that one had the Euro-spec amber-and-red taillights (that’s how they were sold here), it was still a really beautiful car. I think that design has aged really well, whereas the featured car is just a bit too bland for my taste. 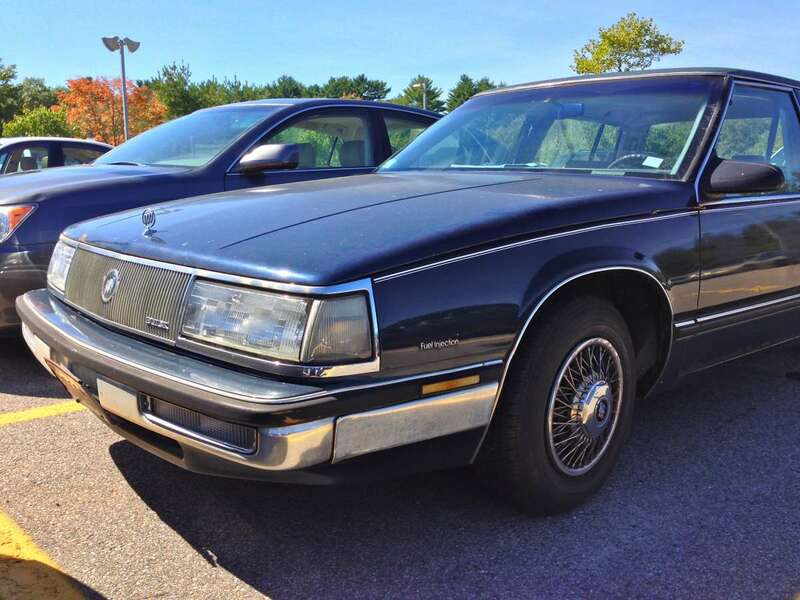 I never understood one thing about the 1991 revisions to the Ninety-Eight and Park Avenue: The Buick – which was marketed to older, “traditional” buyers – got fully exposed wheels and flowing curves, while the Olds – which at the time was repositioning itself to be a Euro-themed, next logical step for Saturn owners – got skirted fenders and what appeared to be an update to Bill Mitchell’s “sheer” styling of the 1970s. I’ve always been perplexed by this decision too. I feel like Olds really could’ve done something special with the 1991 Ninety-Eight. Instead they went with the fender skirts you mentioned, a shovel nose, square trunk, and a ’60s-looking greenhouse. The next GM deadly sin maybe? Here’s a hypothetical to toy with: What if the Aurora came out in 1991 as the Ninety-Eight? 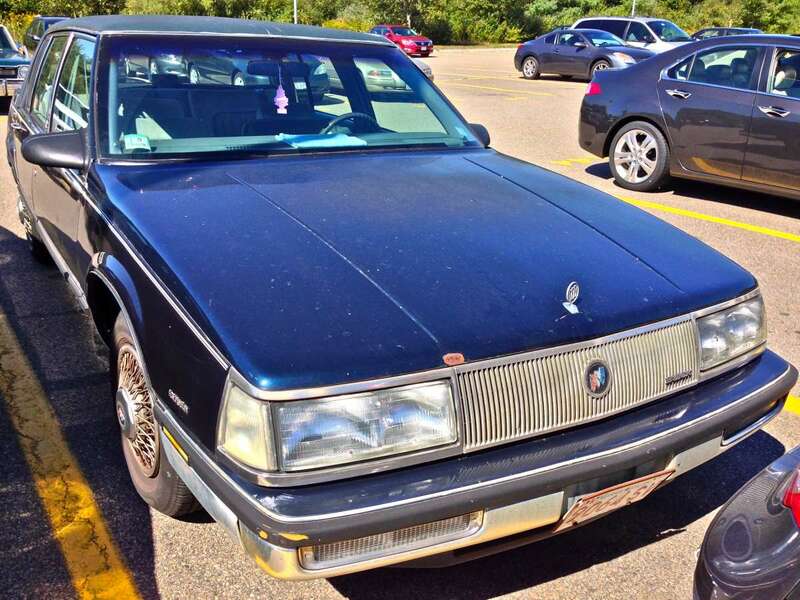 The 1989 Cadillac major refresh (where it started looking more like a proper Cadillac) was the styling introduced for the switch to FWD, thereby totally eliminating the clunky original FWD design. The FWD B (or H) and C bodies had been introduced all together, for model year 1983 (which I think is when they were originally scheduled to appear). They would have seemed fresh for the time, before the Audi and Taurus redefined the landscape so radically. Of course, Chevrolet should be in the mix too with the FWD big car, thereby modernizing along with sister divisions rather than clinging to the hoary Caprice (even though it was solid and well done, its day was over). Assuming a 6 year model cycle starting with MY83, the restyled C and H bodies would have appeared for MY89. Again, all together in one model year (like GM always used to be able to do), and they would have felt fresher and been ahead of the Lexus (well, only by a year, but better than nothing). Alternately, imagine if the 1991/92 C/H body restyle had actually appeared all the way back in 1983. Wow, would have blown the market away! I know details such as the flush headlamps would have to have been different, but the size and shape would have made for a much more cohesive transition to FWD in both roominess and style. In this case, the really “old” Olds Ninety Design of 1991 would have been a very logical follow-on to the fender-skirted style from the 1980 refresh. With this move, cars that felt kind of out-of-touch (although reasonably well executed) when they appeared in the early 1990s, would have been impressively advanced FWD successors to the 1977 generation of cars in the 1980s. 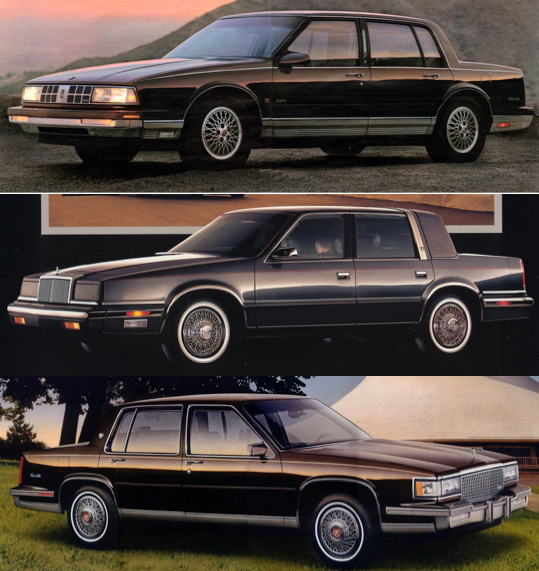 Even sticking with RWD, imagine that the Roadmaster and Fleetwood hit in the 1980s instead of the 1990s (when they felt painfully dated in spite of the aero duds). If they had hit in the mid ’80s, they would have had closer ties to their C-body predecessors, and been at the leading-edge of the aero-look, rather than adopting that style years after everyone else. I don’t think the Lincoln Town Car would have enjoyed nearly as much success in the 1980s if GM had offered fresh, futuristic RWD entries. Sorry for all the final B-Body Caprice lovers, however–in my scenario the Shamu Caprice never would have happened at all. Though it would seem fitting to have the big wagon versions for Buick and Olds, just a fresh continuation of the Estate Wagon and Custom Cruiser and fully appropriate for the senior divisions (plus I think Olds at least was still doing decent volume in the big wagons and could have held on well with the refreshed design). It is easy to imagine so many possibilities of “could have, should have, would have” almost all of which would have been better than the disastrous reality. Interesting, I have played out similar scenarios. Imagine if the 2nd gen E-bodies would have come out in 1986 instead of the very unpopular too small first run? It interesting to note, that around 1978-1979 when the first FWD C-body designs were in the advanced styling studios, they looked more radical that the conservative, boxy styles that came out in 85. This is a 98 styling study from around 1979. 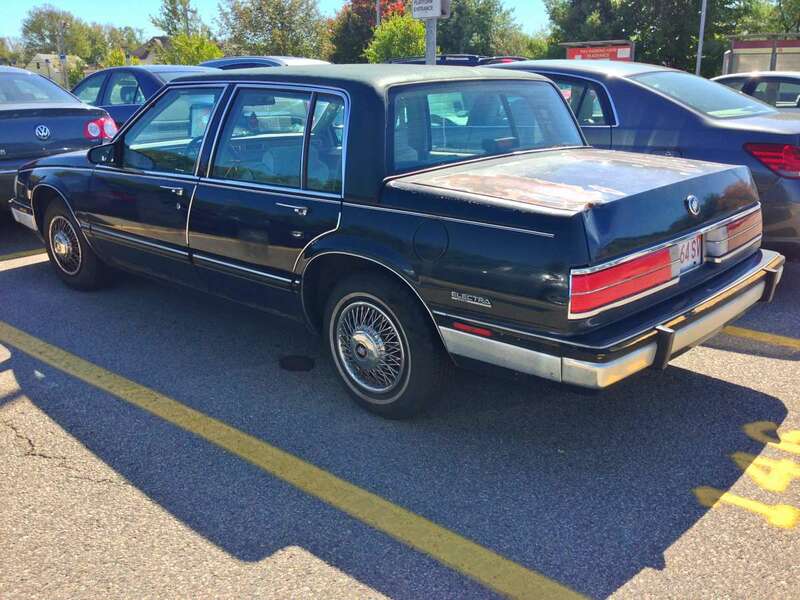 Which looks a lot like a 1989 Fleetwood. On that note, what I don’t understand is the current trend to market pretty much everything to an age group that doesn’t have much disposable income. The fifties dictum, “You can sell an old man a young man’s car; but you can’t sell a young man an old man’s car” when they started redoing Pontiac has become carved-in-stone gospel. Did that generation of Electra/Park Avenue have the front-hinged hood that opened clamshell-style, a la BMW and Saab? Yes. I always thought that was odd, especially because the other C-bodies went with the conventional setup. They also had a clever detail, in how the rear license plate required no mounting screws; instead, you simply opened the trunk, and dropped the plate into a perfectly-sized slot between the taillamps. No need for tools, and since the trunk lid secured the plate, I suppose it deterred license plate thieves. 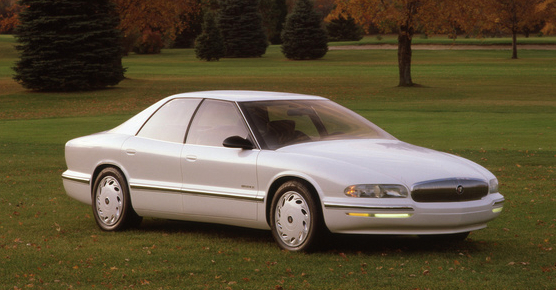 The 1995-1999 Buick Riviera also had that. My 1993 Regal GS had this detail too. Now there’s a cool idea. Never heard that before. I always thought “Limited” referred to the demand for these things. As in, “we’ll limit the amount we make, to the amount we sell”. As a GM C-Body fan, I wish I could warm up to these. However, I just find them boxy, boring and uninspired. 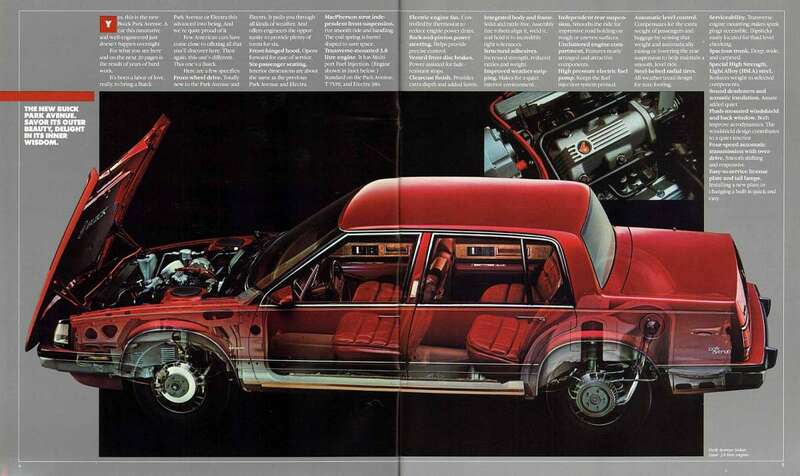 The exterior might have been in vogue had the car arrived in 1983 (which I think was the original timing plan), but in the post-Audi 5000 1985 model year, it was seeming pretty frumpy. And it really looked tired by the time this one rolled off the line. Inside, I thought they were a terrible throwback, with strip speedometers, chintzy fake wood and “casket” door grab handles. Quasi-Euro style mixed with the worst American styling cliches from the previous decade. I did like this car’s predecessor, which I view as one of the last “great” GM cars. My Great Aunt, after decades of driving Chrysler New Yorkers, switched to an Electra in 1981, and then another in 1983 (both Park Avenues). They were very plush and nice, not sporty in any way, but had flair and felt upscale. This one also had a much more interesting instrument panel, with the round gauges (though the acres of fake wood inside was not the best…). I also liked this car’s successor, though I agree with BuzzDog that the more expressive Buick styling seemed a bit at odds with the brand positioning. However, the interior still felt so “old-school” and just reflected the car’s muddled positioning. Still, it is still nice to see this car on the road and in such good shape (especially for New England). Great term! I like it. Now I have a name to call those horrible interior door handles that GM and Chrysler kept into the early-90s. Have to agree with you on the names of Buick models, particularly the LaCrosse. I was so hoping Buick would have revived the Invicta name which was used on the show car which previewed the current generation LaCrosse. Buick has so many great retired names which they have chosen not to use. Electra and Roadmaster being some of the greatest. I would not buy a LaCrosse now because the nameplate seems so dumb. Invicta is another good one. Or Riviera, which also re-appeared on another concept car several years ago. I drive a ’89 LeSabre which believe is the “little brother” of the Electra. I still see these 3.8 Buick’s and Olds all over the place. Given all of GM’s quality issues in the 80’s at these are durable. Mine has 168k on it and I’m hoping for 250k+. By the way my wife got this from her Dad when it was 16 years old and only had 13k on it. 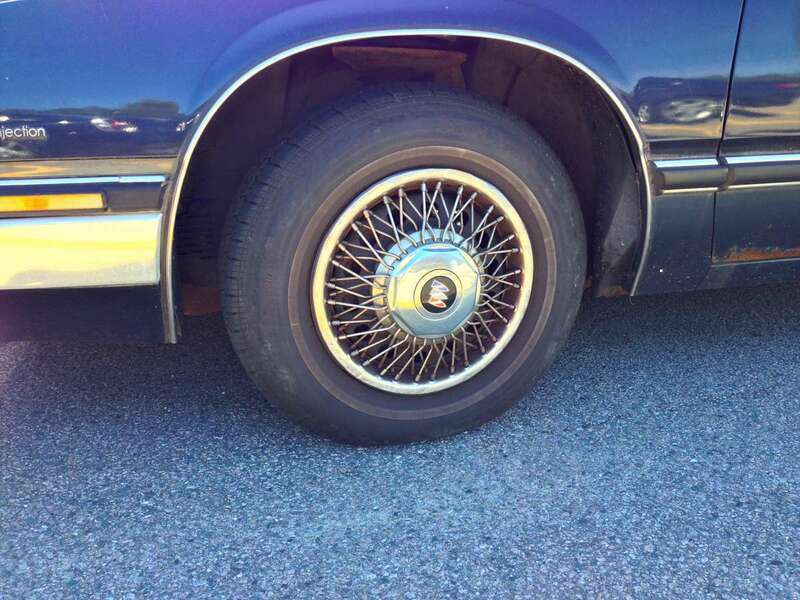 Chris – How did you put 155k miles on that Buick in just eight years? That’s 19,000 miles a year. No biggie. I’ve put 200,000 miles on my Cavalier in ten years. 50 miles a day just for work. …and I bet they took in a lot of wayward Olds owners over the course of the 90s. Your pic of the “C-body” [gag] New Yorker makes it seem more comparable to the big fwd GMs than it really was. It was more of a match to the A-bodies. I know I found my hand-me-down Dynasty more comfortable and solid than the Centuries I’ve been in, but it was too cramped to compare to an Electra. Re: Lacrosse. Can a Canuck confirm that this car had to be renamed for the North, because “lacrosse” is slang for a stick-and-ball game that a man plays solo? Or is that urban legend? Olds stubbed their toe in a big way with the ’91 Ninety-Eight. “And Ford didn’t have the reception it expected in Brazil when their Pinto car flopped. Those that named these cars must have been so focused on creating something memorable sounding, they became blinded to anything else. Now, what activity was always rumored to cause blindness? Hmmm. And the Pinto story appears apocryphal as well – was the Pinto even sold in Brazil under any name? Your Olds/Chrysler/Caddy montage is something I’ve had rolling around in my head for the past week or so – strange to finally see it in print. The similarities are uncanny, eh? Last week I debadged the Ninety-Eight I’ve been working on, mostly to facilitate a proper detailing, but also because I figured I’d like it better that way. But after looking at it for a few minutes, I knew I couldn’t leave it bare… there was just something about it that wasn’t right. I wondered if anyone else would see it. Someone else passing through the garage shortly thereafter: “Why’d you take the badges off? It looks like a Mopar now.” Asked, and answered. Those base and mid-trim Buicks were a common sight around here; they (along with their A-body counterparts) were pretty much the lifeblood of our local Buick/Olds/Pontiac/GMC dealer throughout their production run and beyond. I wish GM would bring back both the Invicta and the Electra name plates. I can imagine a Buick version of the Chevy Volt as an “Electra”, and their version of the Cruze as an “Invicta”. Another great article Brendan, thanks. I was going to suggest “Electra” for an upscale Buick Volt – it would be plug-and-play (sorry…) since they could use the Opel Ampera front and rear fascias. They don’t need a version of the Cruze, it would just dilute the brand image and steal sales from the Verano. Sonic, maybe. I was under the impression that the Verano IS the Buick version of the Cruze. Its more Opel Astra than Cruze. These obviously were great cars, dull styling notwithstanding. A guy on Youtube had one, this year even, but I think the base Electra too, with the 3.8L. They got it free from someone not wanting it anymore and I think at the time, it had around 150K miles on it, and it looked pretty sad then. It was painted in a pale beige color, almost flesh pink but had been so weathered that the color may have fade quite a bit by the time they got it. The battery was bad, but it started right up, once they got enough juice. Anyway, a bit of work, fixed a loose driver’s seat, and it was good to go. Drove it I think 4 or 5 years and finally had to scrap it last year with OVER 250K on it, rust finally did it in as they lived about 2 hours south of Chicago. At one point, the crankshaft pulley cracked, and caused the serpentine belt to shred, taking with it, the crankshaft sensor too. They still have an 88 Park Avenue that is still being driven, and is in MUCH better shape overall. I’m always amused by the constant negative connotation to an “old person’s car”. One of the realities of life is that old people are loyal customers once they’ve found a product they like, and (especially today) are the only people who still have the money to actually be able to buy a new car. The trick is to come up with a product that appeals to an older clientele enough that it becomes the final brand that they’ll continue buying until that inevitable Cadillac ride . . . . . while still having enough appeal that the next younger group will be happy to consider it as their needs and desires are affected by age. Not an easy balancing act. To the younger readers: Such change in tastes are inevitable. I’m now in my early/mid 60’s, and while the Triumph, the Harley and the Solstice will have a place in my garage as long as I’m physically able to drive them; I find I’m looking for something a bit more plush for the xB replacement next year. And even possibly tolerating an automatic. Maybe leather seats. And some of those electronic gewgaws – as long as it handles reasonably well in the twisties. Yes, I’m looking at Buick’s very seriously. You are so correct on needs and desires changing with age. A few years ago, a co-worker in his early ’40’s drove his Trans-Am to work. He got out with a stiff back and popping knees – and he was in great physical shape. I asked him how comfortable it was and he said he was starting to understand why people of a certain age find certain cars more appealing. Terrible, boring cars. Designed to be boring. Built for boring people. Sorry. And boring people’s money spends just as well as interesting people’s. Plus, boring people usually have the advantage of having a lot more available money, having not blown it on all sorts of “interesting” pursuits. Oh, I’m not saying these cars didn’t make GM a ton of money; they probably did. They’re just uninspired-looking. Besides, this thing probably has a bad O2 sensor, bad throttle position sensor, questionable ignition system, bad waveform on the alternator, etc. Pretty soon you don’t notice the check engine light, and it would look weird if it ever went off. I knew people who had BMWs in 1989, they’re not that interesting. T-type was always my favorite but I’ve only seen one Electra T-type in the wild. CC needs to do a T-type retrospective for the Buick brand. My grandfather owned a 1986 Park Ave. It was a comfy and nice riding car. I remember the EL opera lights on the B pillars. I will give GM credit on this car because even today the car looks stately and stands out and though it is a bit stodgy looking the design has aged well. Also the nice thing about these cars(and most of their lines) is that GM decided to use glass for their composite headlights instead of plastic. The result is that 20 years or so later the lights on the cars are still as bright and clear as they were when they came off the factory line. By contrast Ford used plastic lights and as little as 3 years later those start to yellow over. It sounds like playing Lacrosse was just too Alluring for somebody at GM’s corporate office. the Caprice name, when introduced, was found by one car magazine as a “Freak of Nature” in the dictionary I thought of them as such since. A thoughtful treatment of a car that I still sort of consider as background noise. But I am coming around to these a bit, mainly due to a grudging admiration for the way they keep on going long after so many other cars have hit the boneyard. It occurs to me that in the 80s-90s, GM would sell you two kinds of cars. First, cars like these and the A bodies – outdated designs that were only appealing to those over 50, and not all that solid-feeling, but were good, durable cars that would run a long time with little drama. Second, cars that were impressively modern on paper, slightly less so in person, but were quality and durability nightmares that drove everyone under 50 into the arms of FoMoCo or the Japaneses. Not much between. 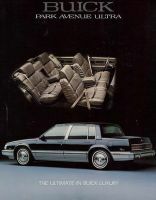 When the C-body launched in 1985, it had the same full compliment of models as the RWD ones, there were coupes and sedans, the coupes, like the plain Electra were rare, the Electra was some sort of odd bridge between a LeSabre Limited and a Park Avenue. I hardly recall seeing any, I think for the first couple of years they called it the Electra 380 as an obvious homage to the Electra 225. And the rare diesel in ’85 was the Electra 430! Oh yes, the 1991 Park Avenue….from the days that pure American sedans and coupes were still officially imported into my country. GM and Chrysler took care of their own cars and Hessing De Bilt imported the Ford brands. The Cadillac Seville, the Buick Park Avenue and Grand Marquis, the Ford Thunderbird and the Lincoln Continental, to name a few. All of them were on the price lists published in the car magazines. Anyway, just 10 to 15 years later they are all gone. The Corvette and a few Jeep models, that about wraps it up these days when it comes to “officially imported”. Here are some Park Avenues for sale. Real bargains, aren’t they ? You know on my monitor, at first glance looking at the small brochure pic from the rear, the taillights appear sectioned and not-wraparound. The car actually looks better if it had that style, it appears more futuristic. Not good for a Buick I guess but gives me an interesting look at a styling what-if. That picture makes the car seem very elegant and classy, in a 1980s sort of way. The interior was cavernous. The forward opening hood gave easy service access, could never blow open accidentally, and if you looked inside Buick had color coded and styled the accessories and engine covers and had very tidy hose routing. Of course the Buick V6 was powerful and economical enough to make these an ideal road car. Just a nice sedan. The 84/85-90 FWD downsize of the C>>>Little C and B>>H are not my favorites but of them I’d say the Buick is the best of the Little Cs and the Olds 88 is the best looking of the Hs. I recognize the merits of the FWD applications but they were just too sawed off looking and in many cases carried over the 70s touches that still looked fine on the RWD versions but just didn’t look right on these. I will, however, look forward to the CC on its successor. The Park Avenue that followed from ’91-’05 or so was a really nice looking car; it’s one one of the few contemporary designs I like, and I’m not a unibody or FWD fan in general, but I’d buy and drive one in a second. Especially in the final years when they brought back the Venti-Ports. Certainly a truer successor to the ’77-’84 Electra P-A than the ’85-’90 version, or anything Cadillac or Oldsmobile did in FWD after 1985. I think I’d even take a ’91-’05 P.A. 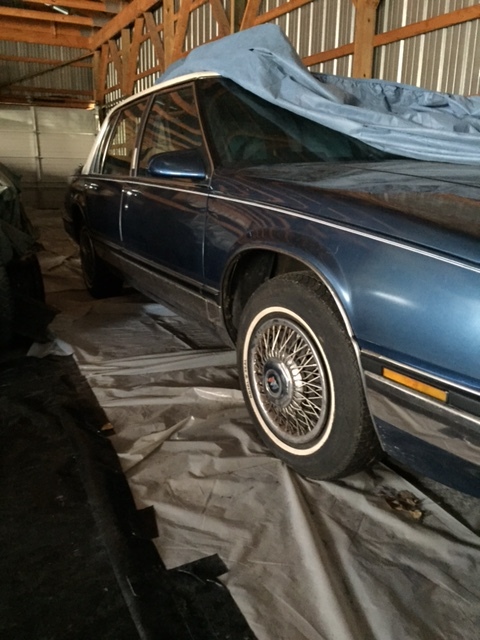 over a whale B/D Caprice, Roadmaster, or Fleetwood. Just a much better looking car than those were. The Lesabre was also on this platform from 87 until 92 I believe. I had a 91 that I loved! The 3800 V6 & overdrive trans were flawless even at 140k. I only got rid of it after I hit a deer with it that caused too much damage. If I found a good deal on another one I’d buy it in an instant. My mother turned her ’89 Park Avenue over to me with last year with only 120,000 miles on the odometer. It drives like I’m riding on air. Just had a water pump replaced, plus an oil leak repaired. Pick up acceleration is amazing. Growing up, My Parents had a neighbor (a bank executive) that would only buy the base Electra model and not the Park Ave (until 1992 after the Electra name was retired). I remember His Electras included a 1977, 1985 (380) & 1989(limited). I liked the simplicity (and understated WASPYness) and rarity of his base 85 & 89 Electras– they were trimmed the same- wire wheel covers, passenger electric recliner (but did not have the opt 6 way power psgr seat) casette stereo, power antenna, cornering lamps– I think the 85 had opts touch climate control too). Don’t know the cost savings of an Electra vs comparably equipped Park Ave. it’s interesting to compare the base 98 regency of these years to the base Electra. I think the base 98 had nicer looking multiple-buttoned loose cussion seats- the olds also gave you std door curtesy lamps (optional on the base Electra), while a standard (cheap looking) dome light lit the base 98 interior (header panel reading/curtesy lights opt) the Electra shared its header panel curtesy and rear sail panel lights with the Park Ave. Leather was available in the base 98 Regency, while not offered in the Electra(cloth only). I was in High school and college back then and preferred the Electra over the 98. These cars were right for their time and were probably one of the best built GM cars of the 80’s. I have an 1989 Buick Electra Park Avenue. I am in need of one hub cap as pictured. Does anyone know of hub cap dealers. Remove the other three then you’ll have a full set and the car will look better. I had a friend whose Toronado had 3 hubcaps. One day in Milwaukee, he pulled up next to another Tornado with only 1 hubcap. $10 and 5 minutes later, both cars drove away with fully matching wheels. Never know when opportunity will present itself. My late father collected old cars and parts. Among those cars is a 1989 Buick Park Avenue. He left a large number of wheel covers, some new old stock. If you are still looking, please let me know, and I’ll check to see if we have a match. To cut down and ugly. Should have been marketed as the century and kept the rwd park ave. I would take a marquis over this any day. It did look better than the cadillac or Olds version . The redesign looked alot better to me. I’m perplexed over this article. We had a 1985 Buick LeSabre, which was built on the same body size/shell as the downsized 1977s. I know, the VIN verified the model year as well as the build decal in the door jamb. I googled a photo of the car, to refresh my memory, and sure enough – it’s not not this little shoebox-sized car as the featured Electra. I then googled a 1985 electra, and get photos with model year for BOTH body sizes! What’s going on…was this downsize a mid-year intro? FWIW, the only source on Google that showed the downsized cars for 1985 is Curbisde Classic. All factory info and photos show the large car. I myself don’t remember this FWD little crapbox until 1986. See for yourself. No need to be perplexed. The Electra was always built on the larger C Body along with the Olds 98 and Cadillac DeVille, whereas the LeSabre used the shorter B-Body. The new FWD C-Bodies (Electra) came out in 1985, but the LeSabre didn’t move to the FWD platform until 1986. 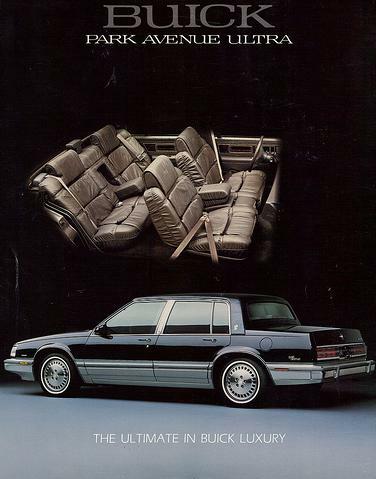 Which made 1985 an odd year: the LeSabre was considerably longer than the Electra. The FWD 1985 C bodies also were introduced in spring 1984, early. Just in time for easing of gas prices. Looks like a ’75-’76 Dart parked behind – hope you can snap that one some time too! I’ve always liked the clear-lensed turn signals, which bring a little Euro to the “Great American Road”. What? No, they don’t. European-spec cars of that era, no matter where made or by whom, were almost 100% likely to have amber turn signal lenses, not clear ones. Light bulbs for cars are much more rigourously regulated in Europe than in America, and while there have been amber bulbs available in America since shortly after the 1963 adoption of amber rather than white light for the front turn signal function, the first amber turn signal bulb (PY21W) type-approved for use in Europe didn’t come along until about 1993 or so. I drove a 1988 Park Avenue when I was in high school and the first two years of college. My dad bought it for me because he equated big with safe (even if these cars were small compared to their predecessors, they were reasonably big for what was available used in the mid-1990s). He got it from basically an estate sale. Yes, it had previously been an old man’s car. And I can attest to the features meant to appeal to retirees — there was no need to slam the trunk lid, you just had to gently set it down and an electric motor pulled it down the rest of the way. At least until it (or something else in the trunk) shorted out and kept draining the battery, and we just disconnected it rather than fixing it. While no teenager would ever consider that car “cool”, it was distinctive. Everyone knew it was my car, because there were no other Buicks driving around sporting a sticker from the local alternative-rock radio station. And everyone wanted me to drive the carpool, since I had a bigger, more comfortable car than everyone else. It was like a living room on wheels. The back seat literally was like a couch. And no, I was never lucky enough to put it to the use you’re probably thinking. I like how the owner of this one replaced the end of the gear shift with that plastic spool. I had the plastic knob on the end of the shifter break off on mine, too. Apparently that was a common problem, as I’ve noticed lots of other GM cars over the years with the end of their column shifter missing. After unsuccessfully attempting to glue mine back on I just made due without it. I admire this person’s creative solution. Whatchya needed was this, which has been available since about 2 months after the warranty expired on the first car with GM’s newly-cheapened-for-1984 column automatic shift lever knobs. But the thread spool’s kinda cool. I might’ve wanted to choose a wooden one instead. Each to their own, but I’ve never understood that uptight rear window treatment on this era of GM cars. its simply awkward and unattractive. It’s a matter of personal taste, I guess. I remember when I first got mine my boss at my summer job commented on how “elegant” he thought the vertical rear window looked. That rear window treatment positively screams “Pickup!”. While at first the upright rear window was a stunning departure (didn’t it first appear on the Volvo? ), it was something unique and actually practical with interior rear headroom. In a sort-of-CC-effect, I saw this car’s near-twin today. Electra of the same generation, post-facelift, wire wheel covers, blue vinyl roof. The one I saw had white paint rather than blue though. Similar condition to this one, too–weathered but still rolling. Six people got into it and drove away as we were leaving, so it was still up to ferrying a large crew around. I have to say I like the “fuel injection” badge in front of the front fender. It’s always kind of interesting seeing old cars with badging touting some feature that now pretty much every car has. Similarly, the Corolla my dad had when I was a kid had a “5-speed” badge on the rear hatch. And it seems like several 1980s cars had a “front wheel drive” badge on the dash. Chrysler’s AA-body cars (Spirit/Acclaim/LeBaron sedan/Saratoga) kept that “FRONT DRIVE” placard clear up through 1995. It took the place of the PRNDL on cars with the shifter on the floor. Remember the “AUTOMATIC OVERDRIVE” fender and trunk badges that appeared on Lincolns and Mercurys starting with the 1980 introduction of their 4-speed AOD automatic transmission? Or the “4-SPEED AUTOMATIC” badges on FWD GM cars? In Europe in the early ’90s, I was amused by the number of badges and decals, obviously factory installed, advertising that the vehicle had a catalytic converter, or an airbag, or two airbags. My 1994 Buick LeSabre loudly proclaimed “DYNARIDE” in chrome letters on the dash. It meant that the car had the standard suspension. A friend’s Mercury Grand Marquis (…de Sade) had a “RIDE ENGINEERED” badge above the glovebox. Uh, sure, okeh. I hated the look of GM’s ill proportioned FWD full size line up when they debuted in the mid 80’s. The design theme of bolt upright styling should’ve been aborted after the RWD models they replaced ceased production. What looked ugly on the outside cascaded into the inside of these cars. GM was clearly out to lunch (as usual) with these cars as they turned away new car buyers in droves. A few months ago I saw one of those last generation (early 90s) Olds 98’s on the road and I was aghast at how horrible those cars look compared to anything built today. We are currently living in the premeir golden age of automotive design and style for sure! I like the conservative styling of the Electra and the Park Avenue/LeSabre. The successor wasn’t bad looking either. Not all ’80s boxy cars were bad looking. The LeBaron/New Yorker from Mopar was sharp for being boxy. These were too. 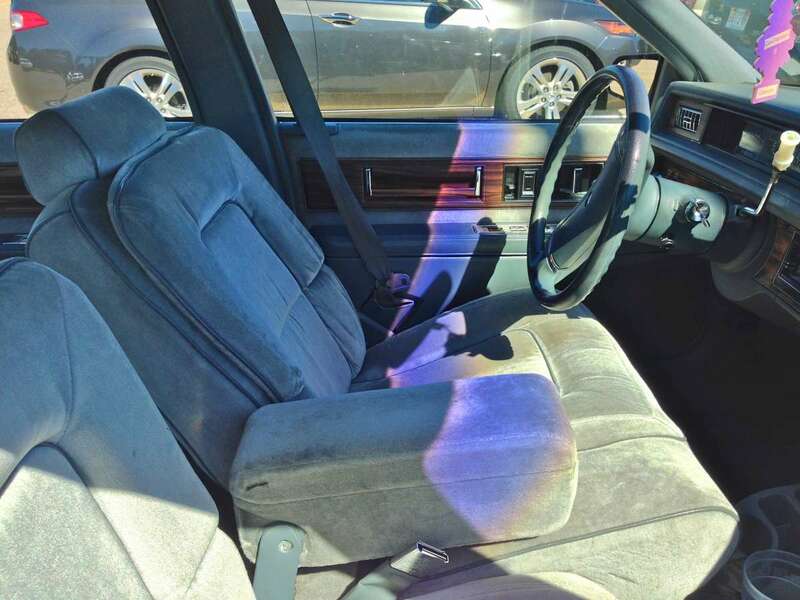 One thing though: why do older GM front seats lean back so much? They all look the same too, same design since the ’70s. Are they even adjustable? I’m a pretty big guy and I think that’s leaned back a little too far. I can only imagine what it would be like for the typical elderly owner of a smaller stature. Or did your rental have the digital speedometer? …because reasons. GM asserted—with a straight face—that this was perfectly safe because their doors don’t fly open in a crash. Except nobody bothered telling the doors and latches they had special dispensation from the laws of physics. Oh, big of them. Shame on GM and the rest of the foot-dragging American industry. My 1971 Volvo has 3-point retractable belts, front and rear, and that was hardly the first year for same. Meanwhile, American automakers putzed around with nasty, uncomfortable, non-retractable/separate shoulder straps up front til ’73, and put only barely-better-than-useless 2-point lap belts in the back seat til yeah, ’89ish. But they had money to put on useless little electroluminescent emblems. …and come to think of it, I’ve always thought the use of “Limited” or “LTD” as a model or trim name is rilly, rilly stoopid: either it’s an unflattering adjective (argue for your limitations and sure enough, they’re yours…) or it’s an untruthful adjective (oh, yeah, it’s a limited edition…limited to, um, the number of people who buy one). I was just thinking about this the other day. I had forgotten about the GM models but noticed that Ford seems to be using the Limited name far to much. The only thing limited about them was the amount of space left at a dealer’s lot for non limited vehicles. Honda also was also guilty of using a name like Special Edition to denote a Accord or Civic that was nothing but a LX with EX wheels and a sunroof. Special Editions are usually final runs of a model’s generation, to move them out. And Limited being base model is name debasement, once was top of the line, exclusive, to cheap-o. Recent example is new Chevy Tahoe Custom trim for 2018, an entry level with only 2 rows of seats. Custom was once a top trim level for Chevy, like Impala Custom Coupe. Although at Ford was base level for years. I had a 1985 Park Ave coupe version of this car in brown with tan leather interior during 1997-1999. It was traded in at our then used car dealership in very good shape with no rust showing on the body. It had two issues that I solved in the matter of 20 minutes flat. The 440 transmission would hang up in first gear with a long delayed shift and the usual GM FWD morning sickness making left turns where the steering got hard to turn were full in effect. A turkey baster and some fresh steering fluid plus some Trans x took care of that and a new vacuum modulator valve cured the delayed shift and the old 440 was shifting perfectly again. The car had well over 100K when we had it traded in and I put around 60K more on it before selling it to a college student for something like 1200 bucks. The original elderly guy who bought it with very low mileage said the drivetrain was original and that he kept the fluids changed at recommended intervals save the steering fluid. It turned out to be a very reliable car and we went all over creation with that thing finding other cars to sell at the dealership. Even the A/C still worked and despite only being rated at 125hp the Buick port injected 3.8 pulled really strong from 0-50 MPH. The padded seats were all day comfortable and it was amazing how much legroom that car had despite being a coupe. Literally every back seat passenger was shocked at the room available in fact to stretch their legs out. 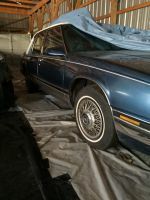 My wife and I had an 88 Lesabre which I believed to have the same basic body as the Electra/Park Avenues until I read this article. I knew of course that the Electras were much plusher with fancier interiors, more bright trim on the exterior, and a longer trunk, but that was the extent of the differences I was aware of at the time. That Lesabre served us very well. It was a great highway cruiser and that 3800 engine would yield up to 30 mpg at 70mph steady. It was one of the best cars we ever owned. Wonder if GM kept the rights fo the name Electra. Would be an ideal name for future models.